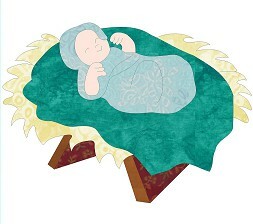 Baby Jesus is the last in the Oh Holy Night series featured at Seams To Be Sew's Block of the Week. Baby Jesus comes in two sizes, one in 8x9 and one in 9x8.. even tho the difference of 1 inch on the measurements doesn't seem to be much of a difference, I think you will be surprised at the difference it does make. The pattern also comes with reversible and non-reversible shapes. You can view the differences between the sizes at: You can read more information about this pattern at: http://www.seamstobesew.com/?p=7683. This design also has the machine embroidery outlines should you choose to use your hoop to do the outlines.